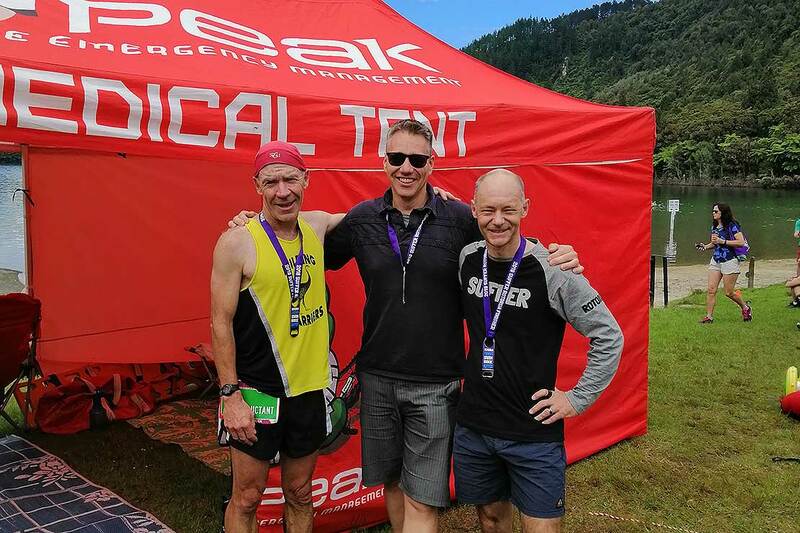 From left: Professor Andy Martin, Associate Professor Paul Plieger and Associate Professor Mark Waterland won the "Suffer" Half Ironman, held in Rotorua last weekend. 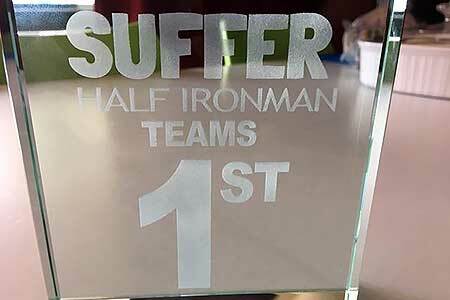 The coveted "Suffer" Half Ironman trophy. A team comprising three Massey University staff won the iconic “Suffer” Half Ironman, starting and finishing at the Blue Lake in Rotorua last weekend. The Massey team, who also competed in last year’s event, crossed the finish line five minutes faster this year to become the overall team winners in four hours and 54 minutes. Associate Professor Paul Plieger completed the two kilometre swim, followed by a hilly 90 kilometre bike ride undertaken by team mate Associate Professor Mark Waterland, who completed the course in a personal best time. Both are from the Institute of Fundamental Sciences. Professor Andy Martin of the School of Sport, Exercise and Nutrition took on the half-marathon run, including the infamous climb from the Green Lake. “This is why they put ‘suffer’ on the race t-shirt,” he says. The course is proudly advertised as the toughest in New Zealand, which was made more challenging this year with a swim 300 metres longer than expected. Dr Plieger indicated, “the overall win was a surprise, but it is especially great to have beaten the younger teams on this tough course”. Earlier this year Dr Martin and Dr Plieger competed for New Zealand at the age group World Triathlon Championships, held on Australia’s Gold Coast.